Playing music with a non-existent piano? Finding a parking lot in just one second? Worrying about online hailed car not showing up? 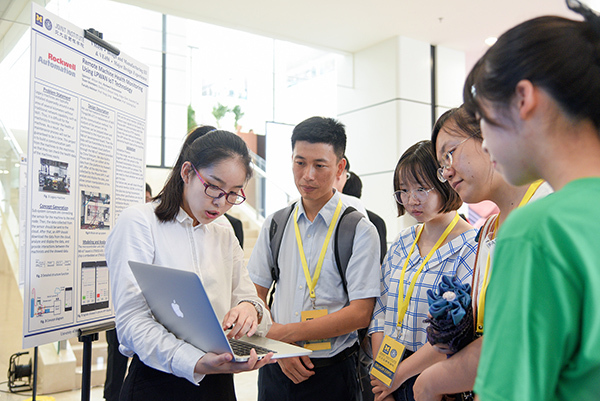 None of these are problems for the University of Michigan- Shanghai Jiao Tong University Joint Institute (UM-SJTU JI) students, as you can find their solutions at the JI 2018 Summer Design Expo held on August 8. 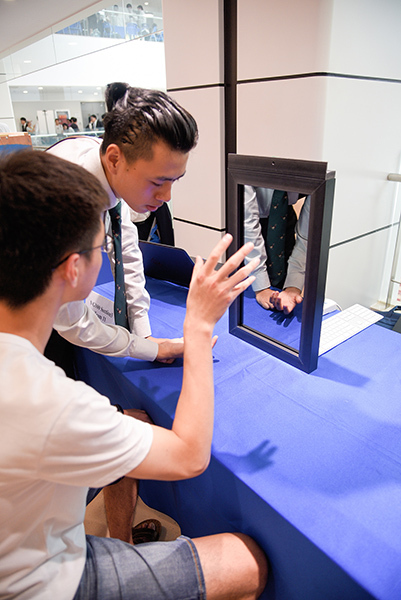 More than 80 innovative student projects were displayed on the show that dazzled the audience including enterprisers, professionals, SJTU and non-SJTU professors and students. The design projects are from a number of summer experimental courses such as “Introduction to Engineering, ”Design and Manufacturing 3,”“System Design and Implementation” and “Undergraduate Research Project.” The semi-annual design expo is an all-round display of JI students’ innovative achievements. “Mirror, mirror, here I stand. Who is the fairest in the land?” In the famous fairy tale “Snow White and the Seven Dwarfs” lives an evil queen who owns a magic mirror, a treasure she is very proud of. But if she comes to JI’s Design Expo and sees this Smart Mirror, the magic mirror she has will not be as treasured. With the Smart Mirror, not only can you dress up, but at the same time you can also browse the weather, schedule, e-mail, and other daily information. This innovative project from the JI freshmen uses a two-layer layout. Despite the functions of a regular mirror, it is also installed with a displayer and voice interaction function. The interface is generated based on information gained by program through different methods from different sources. Moreover, as for the agenda and email, the information is accessed from user’s personal applications. So users can edit them on other platform, which provides them convenience. To protect the user’s privacy from strangers, a facial recognition based on OpenCV library is added to the mirror. So the facial recognition will serve as the entrance of the private information. In the future, the Smart Mirror can be interconnected with other furnitures to make a smart home come true. Give me a flat surface and I will play you Beethoven. This is not magic, but an innovative project made by JI freshmen. The “Virtual Piano” team created a virtual piano keyboard based on the functions of a traditional piano. 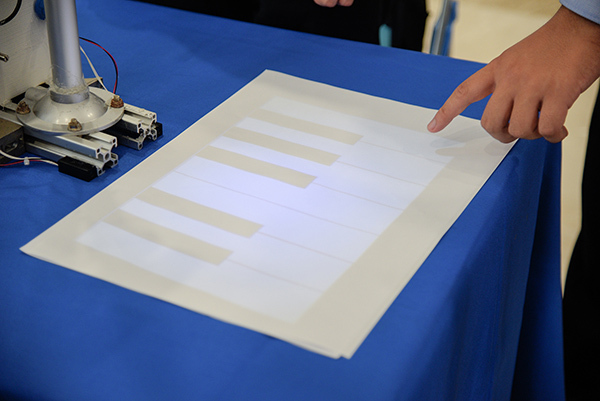 All the user needs is a relative flat surface and the projector will project a pattern of piano keyboard onto the surface. When users touch the desktop, their fingers will reflect the infrared light. The reflection will be detected by the camera. And then Raspberry PI will process the image from camera to identify the keys users press and simultaneously let the loudspeaker produce the corresponding sounds. Music lovers can play and enjoy music anywhere at any time with the Virtual Piano, whether they are in a party, a picnic or on a road trip. We can often see cleaners on a piece of rope cleaning the outer-walls of skyscrapers and it is invariably labor-consuming and risky. The “Remote-controlled Wall Cleaning Robot” team thought of the idea of replacing this dangerous job with robots, which can also reduce the cleaning costs. Existing window cleaning robots in the market cannot be the solution because they can neither cover large area nor go through rough wall surfaces. Accordingly, with inspiration of quadrotors, remote-controlled wall cleaning robot which can be applied to multiple kinds of surfaces is devised. The fan in the center of the car generates a low-pressure environment between the chassis and the vertical wall, which enables the car to run stably on the wall by increasing normal forces and frictional forces. As a prototype, the robot can also be optimized to cater different needs in other fields like fire-fighting and track-shooting. As a JI’s brand course, “Introduction to Engineering” allows students to participate in interesting projects. Students are encouraged to find problems in daily life and use the basic engineering knowledge to solve the problems with innovative thinking. 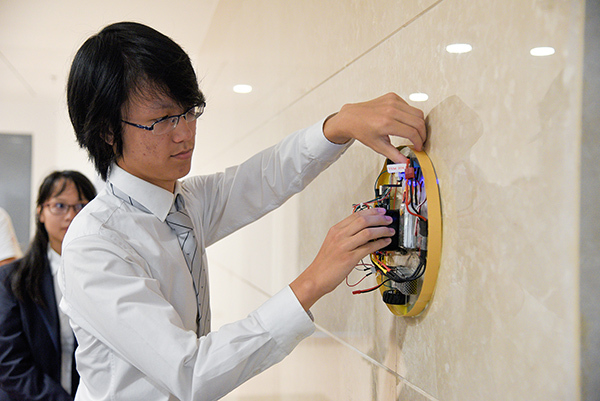 According to Professor Yanfeng Shen, “Introduction to Engineering” is more like a discovering course, where the course focuses more on the students’ “engineering instinct” and lead them to find, ask and solve problems from a scientific and professional perspective. In addition, the course teaches technical writing in English, an essential skill for engineers. In light of the growing needs of large data and artificial intelligence around the world, more science and technology courses will be added under minor degrees of data science and computer science, on top of the existing computer and engineering courses at JI, in order to train talents in “New Engineering”. 2018 may be considered a golden age of intelligent interconnections. From the devices we wear,shared bikes to smart furniture and autonomous vehicles, the concept of intelligent interconnection has embedded in our life and has spread its magical experience everywhere. 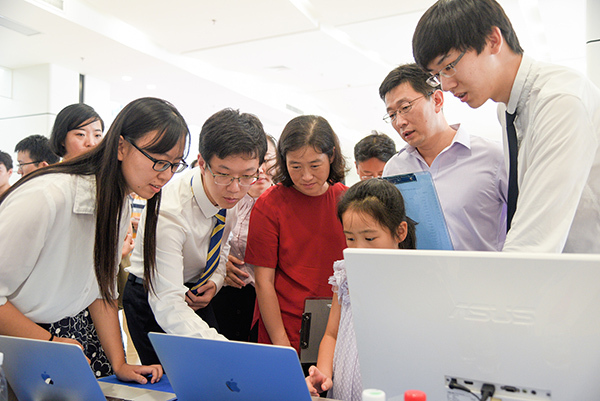 These keywords in the science and technology industry have been fully demonstrated in the eye-catching JI seniors’ projects, becoming the focal points of the design expo. Internet of things is considered to be the third big hit in information development after computers and internet, and transportation is considered to be the most promising application in all scenarios. Estimated time of arrival (ETA) for vehicles is widely used and needed in daily life for either self-driving or taxi services. The “Data-driven Estimated Time of Arrival” team sponsored by Didi estimated the time to destination through calculating the road condition, weather and other elements from large data collection, to improve the accuracy of the estimated arrival time. When posting something large, how long does it take to first measure the volume of the cargo then calculate the delivery fee? Usually the courier would bring a tape measure, measure the length, width and height of the cargo and calculate the cost by hand. This is not only time and energy consuming, but also quite error prone. 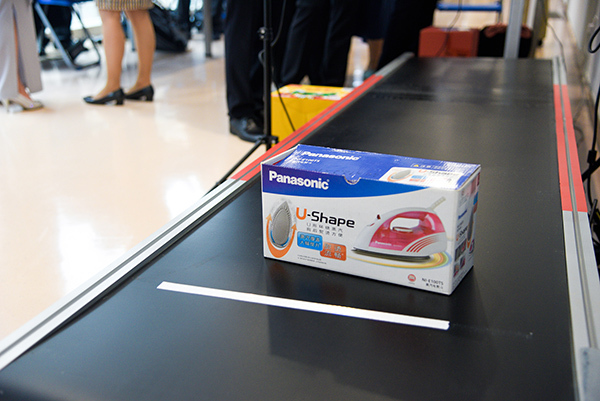 The “Automatic Measurement System for Cargo Volume” team sponsored by Panasonic introduced a new technology, where they use depth cameras to take depth and infrared ray images of the cargo and coordinate transformation to get the point cloud of the cargo in cartesian coordinate. Then they align the point clouds from two filming angles according to reference points, and return a 3D model of the cargo. Customers can see the shape and the estimated volume (freights) of the cargo. Then they can arrange the package loading according to the result. Nowadays, remote health monitoring for legacy machines relies on advanced sensors. The machinists need to check the readings on the sensors in order to find out whether the machine is working normally or not. It leads to extra human work and cost. Because the installation environment for those legacy machines does not have network, remote machine health monitoring becomes very difficult. The “Remote Machine Health Monitoring Using LPWAN IoT Technology” team sponsored by Rockwell Automation aims to construct the communication network from the sensors attached on the machine to a remote application. The communication does not rely on traditional network, WiFi, but on Narrowband Internet of Things (NB-IoT). They also made an Android App that can extract and visualize the health data, and conduct further analysis in order to support remote machine health monitoring. JI is setting up a joint research center for smart connected systems with UM, to conduct high-impact interdisciplinary research in areas related to smart connected systems, such as smart sensing, wireless communication and networks, machine learning, and artificial intelligence. The research results of the center are expected to advance IoT applications in smart transportation, smart health, smart city, smart vehicles, smart grid, etc. The center will strive to bridge fundamental research and engineering innovations, and also promote technology transfer and commercialization. Corporate-sponsored graduation Capstone design projects have played a huge role to the success of the JI design expos. This year, all the 27 Capstone design projects were sponsored by 18 leading companies including alumni enterprises such as ROBOTERRA, CyberInsight and RELX, and these daily-life related subjects are all from the first-tier technical projects of enterprises. JI is the leading institute at SJTU to carry out pilot reform of undergraduate graduation designs, abiding by a totally different model from other engineering schools in the country. JI combined the mechanical engineering and electrical and computer engineering courses as required courses. The graduation design subjects areset by enterprises based on real life engineering problems. Under the guidance of professors and company engineers, JI students need to submit a team essay and an individual essay in English, and participate in an English oral debate as a team at the end of their graduation projects. Since the first corporate-sponsorship was launched at JI in 2010, more and more multinational companies have sponsored “custom” projects that follow their market trends. In recent years, the proportion of JI’s corporate-sponsored projects has increased every year and JI students have earned accolades from the sponsors. The companies would like further collaboration with JI in capstone design, scientific research, scholarships, internship, employment and career development guidance. Through the courses, exchanges and other effective means, JI stimulates students’ creative thinking and provides a multichannel and comprehensive platform for talent training and business cooperation. According to the design expo supervisor Professor Chengbin Ma, all the graduation design projects are sponsored by enterprises. Sources of sponsors and their businesses have become more and more diversified and internationally extensive. In the past, the sponsors were mainly American companies. Now more and more multinational corporations, large state-owned enterprises and the leading civilian enterprises from various countries join the sponsorship list. The cooperation projects tend to penetrate into the fields of information technology. Artificial intelligence and emerging Internet technologies have become one of the new leading directions.